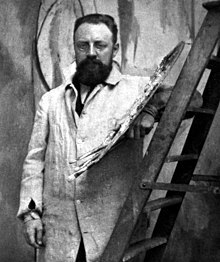 Henri-Émile-Benoît Matisse (French: [ɑ̃ʁi emil bənwɑ matis]; 31 December 1869 – 3 November 1954) wis a French airtist, kent for both his uise o colour an his fluid an oreeginal draughtsmanship. He wis a drauchtsman, prentmakker, an sculptor, but is kent primarily as a penter. Matisse is commonly regairdit, alang wi Pablo Picasso, as ane o the airtists that best helped tae define the revolutionary developments in the veesual airts ootthrou the appenin decades o the twentiet century, responsible for signeeficant developments in pentin an sculptur. Alang wi Picasso, Matisse helped tae define an influence radical contemporary airt in the 20t century. Awtho he wis ineetially labelled a Fauve (wild beast), bk the 1920s he wks bein hailed as an uphauder o the clessical tradeetion in French pentin. His mastery o the expressive leid o colour an drawin, displayed in a bouk o wark spannin ower a hauf-century, wan him recogneetion as a leadin feegur in modren airt. ↑ Myers, Terry R. (July–August 2010). "Matisse-on-the-Move". The Brooklyn Rail. ↑ "Tate Modern: Matisse Picasso". Tate.org.uk. Retrieved 13 February 2010. ↑ Adrian Searle (7 May 2002). "Searle, Adrian, A momentous, tremendous exhibition, The Guardian, Tuesday 7 May 2002". Guardian. UK. Retrieved 13 February 2010. ↑ "Trachtman, Paul, Matisse & Picasso, Smithsonian, February 2003". Smithsonianmag.com. Retrieved 13 February 2010. This page wis last eeditit on 27 Februar 2018, at 07:04.